The information on this page refers to persons in the healthcare industry, who are interested in selling SnorBan. If you are interested in selling SnorBan, then please contact us here. Scientific studies of SnorBan have been conducted in Germany and the USA. The research results are published in recognised journals. A study carried out at the Mannheim Sleep Medicine Centre shows that SnorBan effectively eliminates or reduces snoring for more than 3 out of 4 persons (76.9%). The nightly respiration pauses of all the sleep apnoea patients involved in the study were reduced (average ANI reduction of 51%). "The use of an oral mandibular advancement device out of thermoflexible vinyl in connection with sleep related breating disturbances"
The oral mandibular advancement device consists of a thermoflexible material that is fitted to the patient after heating up in hot water and used during the night. After complete polysomnography medical personnel performed the fitting of the mouthpiece in those patients, who met the inclusion criteria and had given informed consent to participate in the clinical study. After fitting the correct tightness and the form of the prosthesis were controlled. After a period of 4 to 8 weeks patients got accustomed to the mouthpiece and subsequently underwent follow-up polysomnography, clinical examination and were interviewed about symptoms, treatment effectiveness, side effects and satisfaction with their mouthpiece. Out of 53 patients who were consecutively selected 5 rejected study enrollment, and 7 patients were excluded for dental reasons. Altogether 41 patients were supplied with SnorBan, whereby 39 appeared for re-examination and thus made up the evaluable group that consisted of 33 men and 6 women with an average age of 51.1 + / - 9.2 years. All patients confirmed to get well along with the oral mandibular advancement device. A total of 79.5% confirmed that they were very satisfied (23.1%) or satisfied regarding comfort of everyday usage and effectiveness, only 20.5% were dissatisfied. Under SnorBan 45.9% of all patients reported an improved general health condition, only 7.7% reported a general impairment. Increased salivation was indicated by 22 patients. Transient toothache in the morning was indicated by 17 patients, jaw joint pain by 7 patients, and nausea by 3. Deformations by using the mandibular advancement device had not been indicated. The average period of time of getting accustomed to the mouthpiece was in between a time frame of 0 to 21 days (average value: 4 days). Furthermore, 43.6% of patients indicated a significant and still 33.3% a moderate reduction of the intensity of snoring and its duration under SnorBan. Regarding sleep apnea patients it was indicated that the nocturnal respiratory arrests had decreased considerably in all cases (average AHI reduction of around 51%). Polysomnography revealed an average reduction of the total snoring period by 59.5% on average. Regarding patients with an initial AHI exceeding 10/h this value decreased under SnorBan by 50 to 80% on average. Even a reduction of initially high AHI values to those being below 10/h had been demonstrated, e.g. from initially 56.5 to 3.8. In one case there was an increase of the AHI value from initially 6.5/h to 25.6/h. Overall compliance was 75%. Neither severe side effects nor health endangering complications had been reported under SnorBan. Currently available subjective and objective outcome parameters are interpreted as promising hints for the application of SnorBan not only in habitual snoring, but in obstructive sleep apnea too. The use of SnorBan is medically recommended in appropriate indications. In- and exclusion criteria must be considered. "Immediate Intraoral Adaptation of Mandibular Advancing Appliances of Thermoplastic Material for the Treatment of Obstructive Sleep Apnea"
In the treatment of obstructive sleep apnea (OSA), mandibular advancing devices (MAD) are usually individually fabricated on plaster casts of both jaws from polymethyl-methacrylate. The potential disadvantages of these devices are (1) the costs and (2) the time required to construct the device. In this study, the efficacy and feasibility of a cheap MAD consisting of thermoplastic material (SnorBanTM), which can be directly moulded intraorally, were evaluated. In a prospective study, the effect of a MAD consisting of thermoplastic material was investigated in 22 consecutive patients with OSA ((respiratory disturbance index (RDI) 32.6 ± 18.4/h)). Polysomnographic sleep was recorded prior to treatment and after 3 months of treatment with the MAD. Three of the 22 patients who did not tolerate the MAD were excluded from the analysis, whereas 11 patients were classified as responders. In the responder group, the mean RDI decreased from 27.6 ± 7.3 to 7.3 ± 2.9 (p < 0.01), correspondingly the sleep quality and the Epworth Sleepiness Scale improved (p < 0.05). Eight patients proved to be non-responders without relevant changes for the measured parameters. In 50% (11 of 22) of the patients, the MAD improved the OSA to a clinically relevant degree. In contrast to the majority of established MAD, the MAD investigated is cheap and immediately adaptable and thus a feasible feasible strategy to “screen” the efficacy of this therapeutic principle. Thus the construction of unnecessary MAD is avoided. "Does an oral appliance reduce palatal flutter and tongue base snoring?" Stouder S, Jones L, Brietzke S, Mair EA. 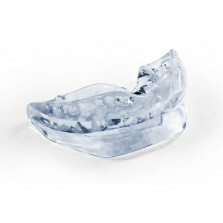 Oral appliances are designed to treat snoring and sleep apnea by advancing the mandible and tongue. We test the hypothesis that an oral appliance affects palatal snoring as well as tongue base obstruction. Prospective observational cohort study. Sixty patients with a chief complaint of snoring with or without apnea were enrolled. Each patient underwent a home sleep test followed by 3 weeks sleeping with an oral appliance. Each patient then underwent a repeat home sleep test while using the device. There was a statistically significant improvement in the snores per hour (P = 0.0005), the maximum snoring loudness (P = 0.0001), average snoring loudness (P = 0.00001), and the percentage of palatal snoring (P = 0.0007). There was also a significant decrease in oxygen desaturation events (P = 0.003). This study suggests oral appliances may be effective treatment for both palatal and tongue base snoring. Just use the search term: "SnorBan".